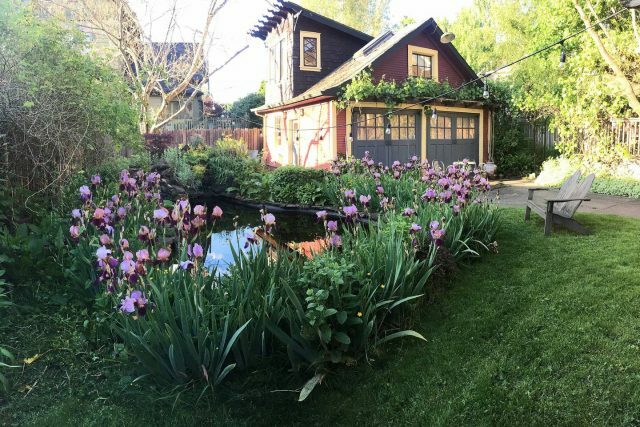 Our first Airbnb was this sweet cottage in Portland. It was very hot in August, but this home was air-conditioned. It’s also in a great eastside Portland location. Brett and I have enjoyed looking back at all the Airbnb homes we stayed in on the first part of the Big Adventure, and I thought I’d share the actual listings. I was put in charge of choosing the rentals for each of our destinations before we set off on our adventure. I weighed price, amenities, location and read review after review to get a feel for different rentals and which would be a good fit for us. Some of the places we rented we liked more than others, but all were clean, had a comfortable bed, plenty of hot water and everything we needed to fix our own meals. Every single one of our hosts had at least bottled water stocked in the refrigerator when we arrived, but many had wine and snacks waiting for us, always appreciated after a long travel day. 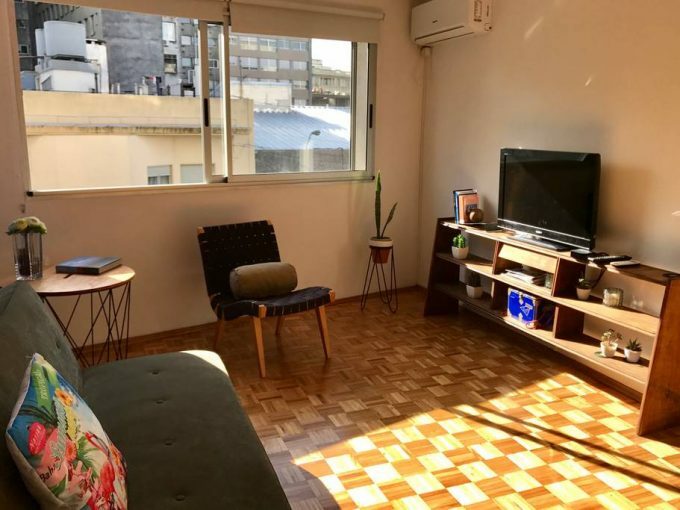 This studio in the Recoleta neighborhood was our home for ten days in Buenos Aires. There was a jetted tub in the bathroom, wonderful for a relaxing soak after long days of walking. 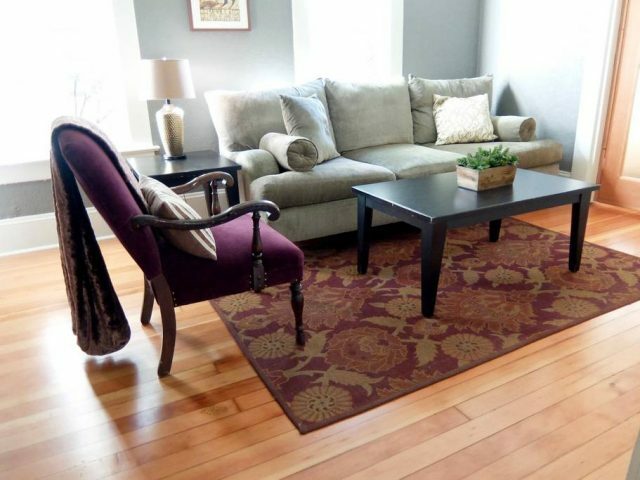 This apartment made our top three (#3). The living room of our apartment in Montevideo. The apartment was very cute and clean, and in a great location to visit the old city and get down to La Rambla, but we were warned against going out at night in the neighborhood. I tried to keep our lodging costs under $70 per night. Some places we ended up reserving were over that, but others were (way) under, and it all balanced out. I knew that some places (like Paris or Florence, for example) were going cost more than others, so we saved in other locations in order to balance out those higher costs. 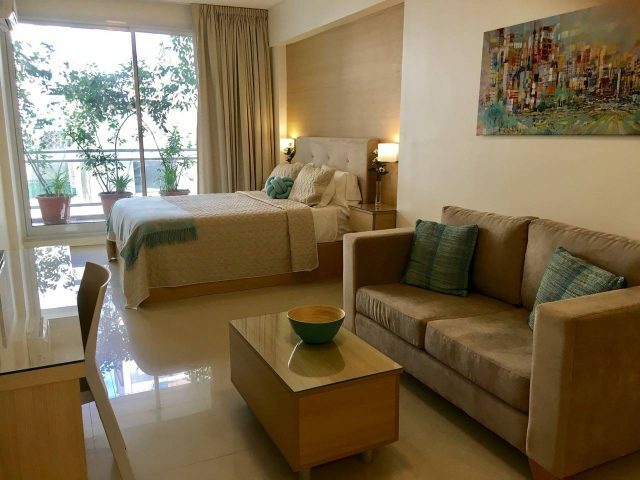 However, although the cost per night posted for some listings is much higher than our budget limit, we generally paid less, and we were able to stay within our budget or close to it because staying a week or longer prompted a generous discount. All of our Airbnb rentals were paid for ahead of time from our travel savings. The kitchen of our apartment in Montmartre, Paris, was small, but the best equipped of any place we stayed. 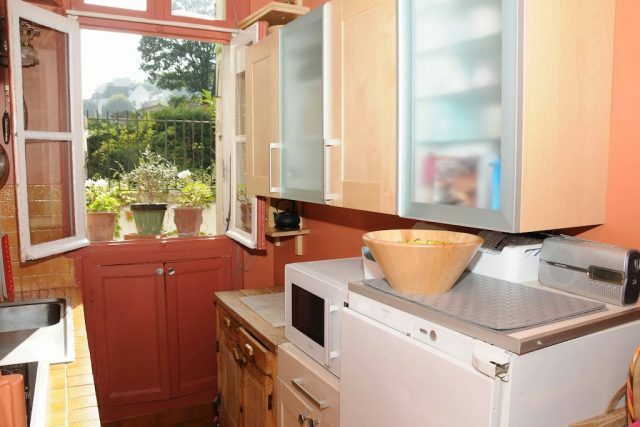 Plus, there was a wonderful view from the kitchen window. 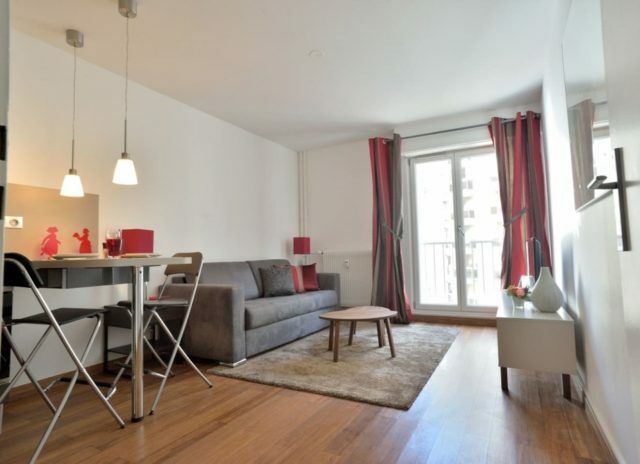 The location of this apartment was superb – right in the heart of Montmartre, and at an affordable price. 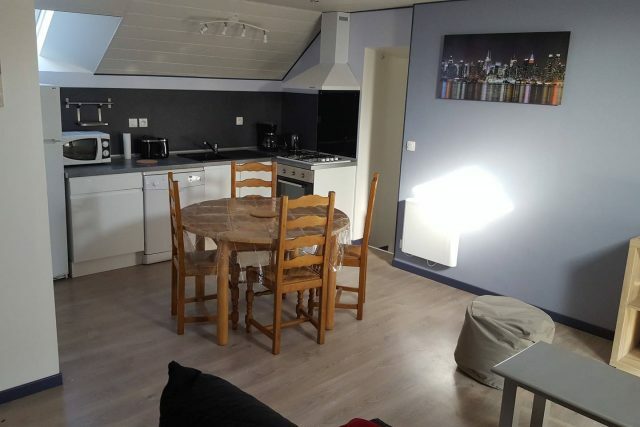 Our apartment in Balleroy, Normandy was very cozy, and in a great location for driving around the area to visit the Normandy beaches and other sites. The hosts had a bottle of their homemade cider waiting for us in the fridge along with juice and water. As far as amenities, WiFi, a fully-equipped kitchen, private bath with a shower, and a washing machine were necessities. We also wanted a sofa so we had a place to relax at the end of the day. Many of the places we rented came with a dishwasher, which was nice but not a deal killer. Also, some buildings had elevators, but in several places we had to climb several flights of stairs – it was good exercise! The one place we worried about more than any of the others before arriving was the apartment in Strasbourg. I have no idea why I chose it other than the location in town was great, but it was tiny, had a sofa bed and didn’t have a washing machine . . . and we were booked for three weeks! It turned out to be one of our favorite places with one of the most comfortable beds of all. We adjusted easily to the small space, and a laundromat was just a couple of blocks away, so taking care of our laundry was never a problem. Best of all, we had a wonderful host and had the great privilege of dining with her family toward the end of our stay. Our studio in Strasbourg was less than 300 square feet, but was still very comfortable and in a great location for exploring the city. This place also made our top three (#2). 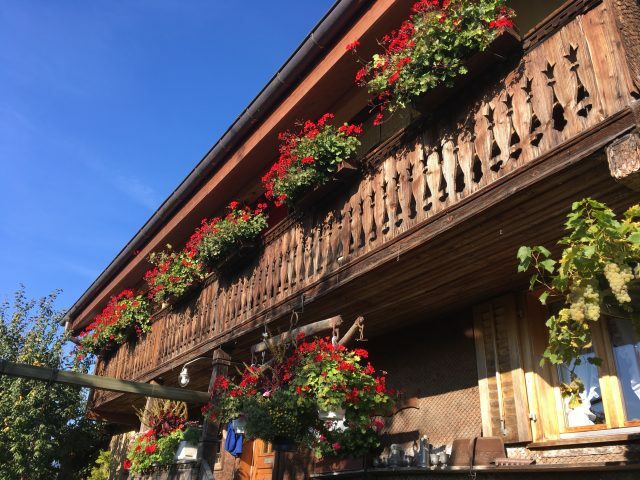 Our bed & breakfast stay in this nearly 300-year old Swiss farmhouse in Sempach Station, outside of Lucerne, was our favorite Airbnb experience. The hosts’ hospitality was warm and generous, and we loved spending time with their family and in the area. Our favorite stay though was not in our own apartment, but as guests in a Swiss farmhouse B&B outside of Lucerne. Our room was big and clean and we had a large, private bathroom, but it was the family that made our stay so memorable. They spoiled us rotten, taking us and picking us up each day at the train station, showing us around the area, and included us one evening in their family dinner, serving a traditional Swiss raclette. Our farm breakfasts each morning were nothing short of magnificent. The entire three-night stay in the farmhouse from start to finish was remarkable. 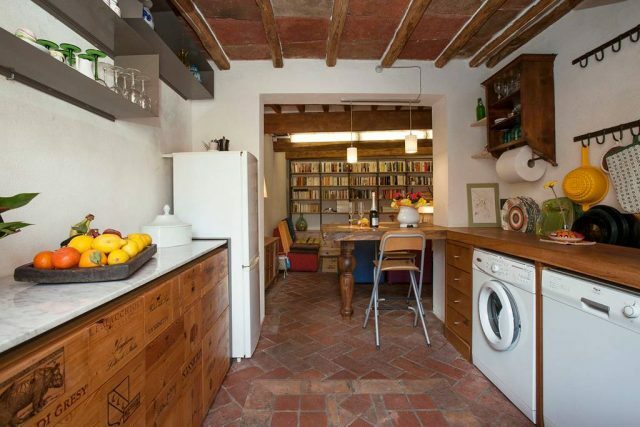 This large apartment in Bordeaux featured open beams and stone walls, and included a special refrigerator for wine! After our small apartment in Strasbourg we felt like we were swimming in space, but it was a great place to come home to at the end of the day. I’ve written that our least favorite stays were in Montevideo and Rome. With Montevideo it was the location – during the day it was fine, but we were warned about going out at night so were always stuck in the apartment. 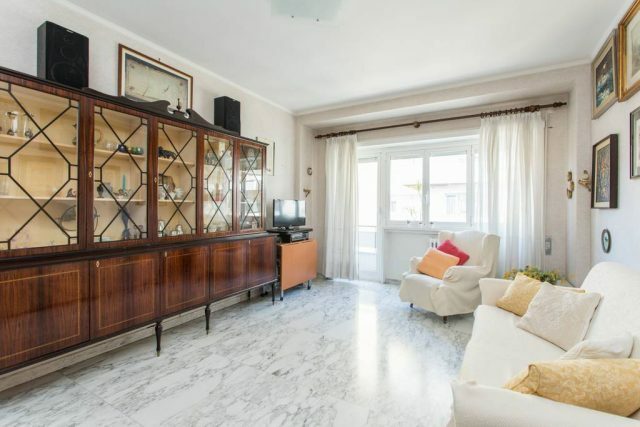 In Rome, the apartment turned out to be much larger than we imagined, and while all the marble looked pretty in the pictures, it actually felt cold and unwelcoming, to us anyway. Our Florence apartment, located in the Oltrarno neighborhood was our favorite apartment. It had been remodeled to show off many of the original architectural features of the space, and had every convenience along with a drop-dead view from the kitchen window. Our apartment in Rome was very large, and the amount of marble left us cold (the actual living room is also a bit more cluttered than it appears in this photo). 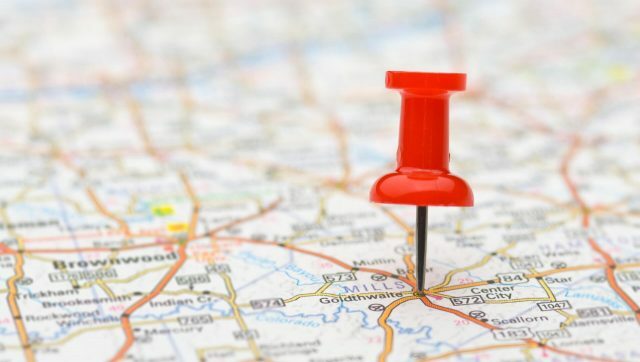 Still, the apartment’s location and conveniences made it a good choice overall. We won’t be staying in an Airbnb again until we arrive in Perth, Western Australia, toward the end of January – we’ll be using hotels in both India and Hong Kong. After our train journey across Australia we’ll stay in another Airbnb rental in Sydney. Both the Perth and Sydney rentals are private residences, but when we move on to New Zealand we’re booked into five different private rooms because our stays are so short in each town. Some will include breakfast, some won’t. In Japan we will be renting an apartment directly from the owner, and then will be back in an Airbnb rental for our summer stay in Portland, this time on the west side of town, a new experience for us as we always lived and stayed on the east side of the city. 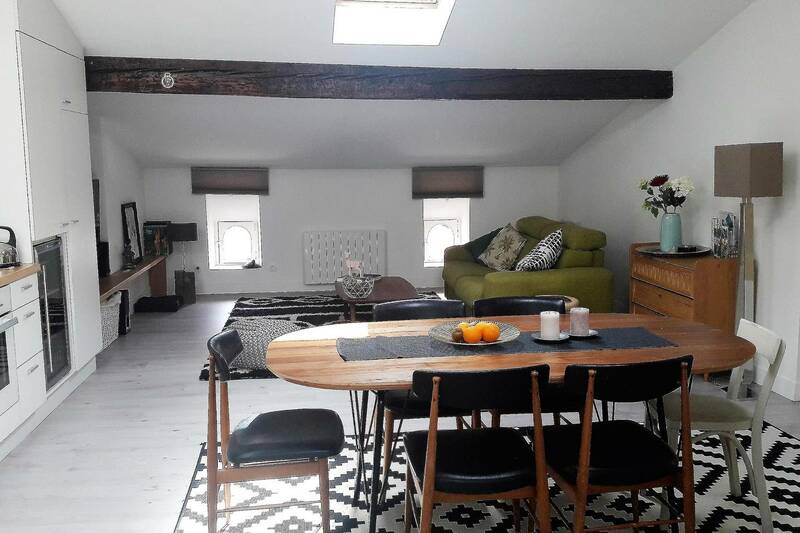 In the fall of next year we’ll do our last Airbnb rental of the Big Adventure during our three-month stay in the Cotswolds District in England. Our apartment in Lisbon was small but had every convenience. It was quiet, in a great location, and was very, very comfortable – we wished we could have stayed longer. 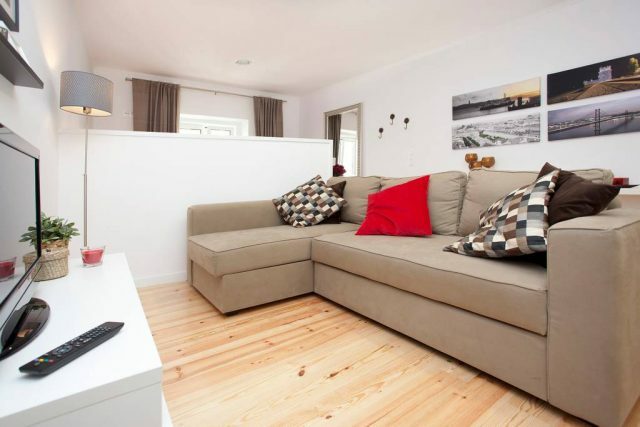 If you have ever thought about using Airbnb but haven’t, I highly recommend giving it a try. We have had nothing but great experiences. We learned a lot about how to go about having the best experience possible from the Senior Nomads’ wonderful book, Your Keys, Our Home, starting with how to go about selecting an Airbnb rental that will be the perfect fit for you and your budget. It’s full of good information about how to make the most of any Airbnb stay from start to finish. Our current home in Portland has two bedrooms and enough beds and space for us and our girls to enjoy a comfortable stay. The kitchen is big, and the location has been great for all we’ve been up to since we arrived..
We checked out the wreaths at Trader Joe’s but they were too heavy to hang in the house so we got a fresh pine swag instead. I haven’t done one of these posts for a long time, but it’s a good fit for now, for catching up and keeping track of what we’re doing and where we’re going. Brett and I have settled in nicely here and are almost well – our colds are now hanging on to the ledge by their fingernails.. One thing I had forgotten about living in Portland was how often I used to get sinus headaches when we lived here, and have had to deal with them a few times since we arrived – not fun. The air here seems very dry to us too, but we’ve set bowls of water out on the heat registers around the house and that is helping somewhat. We are feeling well enough though to get together with friends again beginning this week – up until now we still just felt too awful to see anyone. 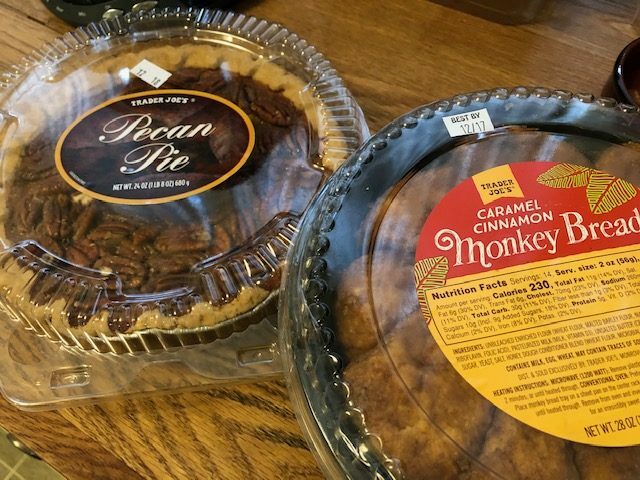 I love Trader Joe’s, but am staying away now until after Christmas! Most of our errands have been taken care of, thank goodness because I am sick to death of spending and shopping! We will be going to Fubonn Asian Supermarket on Tuesday to get YaYu all her noodles, and to Safeway on Wednesday or Thursday for a few odds and ends that can’t be found elsewhere, but otherwise we are pretty much done and ready for our girls. We have everything we need for all meals during the rest of our stay here. No matter where we’ve stayed on our adventure, we’ve shopped for a while but then comes the point where we start working on making sure everything we’ve bought gets eaten or used up before we leave. We’ve done a pretty good job so far during our travels, so hoping it goes as well here. My goal is that we have to go out to eat our last night in Portland because the fridge and cupboards are empty. 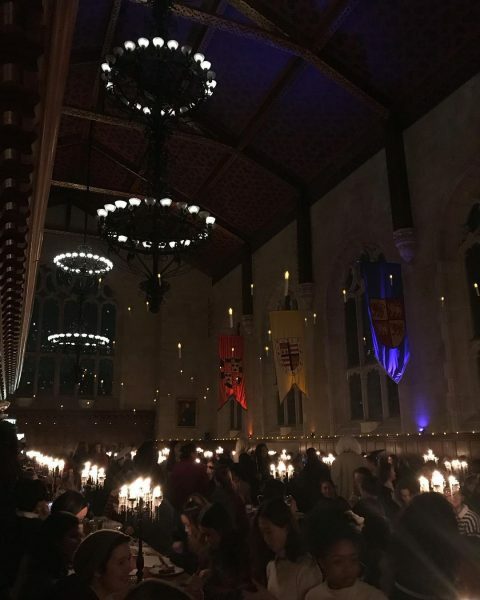 The dining hall at Bryn Mawr was transformed into the one at Hogwarts, including the floating candles! Love the candelabras on the tables as well! 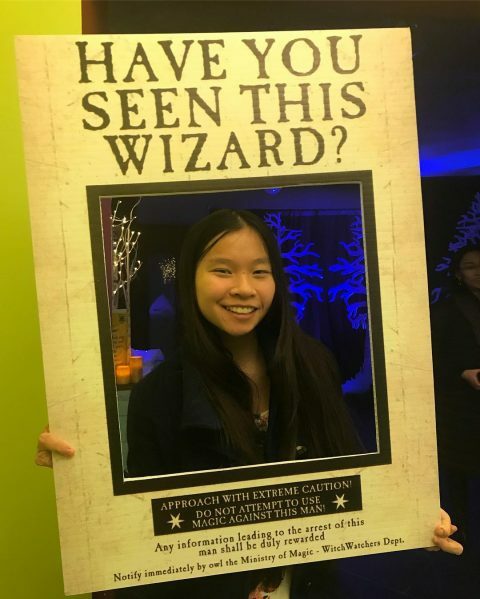 Bryn Mawr held their annual winter end-of-term dinner this past week, where they dress up their dining hall like Hogwarts, faculty and students come in costume, and students are assigned to different schools (I think YaYu is a Hufflepuff?). I’m so glad she and WenYu have settled in so well at their colleges, and are having such memorable experiences (and doing well in their courses). Meiling is currently in New York City with her boyfriend. He moved there earlier this year to work for a big tech company, and they seem to be doing a good job of managing their long-distance relationship. We’re going to meet him when he’s in Portland later this month, and he’s also going to come along with Meiling when she visits us in Japan next spring! Reading: Nothing! Or at least not a book right now. I have had a terrible time trying to read these past few months – nothing seems to hold my interest for very long, and I’ve also had problems staying awake. Listening to: It’s a typical quiet morning for Brett and I. He’s reading and I’ve been working on this! We’re looking forward though to all the noise and hubbub that will come along with the girls this week. Watching: Brett and I were all set to watch Season 4 of Better Call Saul, but that turned out to be a one-day binge opportunity so we missed out on it. There are things on Netflix and Amazon Prime (Man in the High Castle) we want to see, but those can wait until Meiling arrives with her stick and tech abilities next week. The other day Brett and I clicked through all the many, many cable channels we have here and could not find even one thing that interested us, a pretty good indication we will not be signing up for cable later. Cooking/baking: Tonight we’re having leftover tacos, along with some refried beans. We had them night before last but there was lots left over so we’ll finish that off tonight. We picked up a frozen cherry pie this past week and I’m going to bake that later today – I have been craving pie. Happy I accomplished this past week: I am glad we’ve gotten most of our shopping done, but it turned into a chore. We’re just not very enthusiastic spenders these days. Also, we’re so glad we got hair cuts – that was something that definitely needed doing. I ordered some gifts for our granddaughter from Amazon (after looking all over town and not finding what I wanted) that will tuck nicely into my suitcase, and weigh next to nothing. Not my accomplishment, but Brett took care of our visa applications for both India and Australia and we are set to enter those countries. Finally, I got all the Christmas presents wrapped and ready to put out on Christmas morning! Looking forward to next week: Well, besides all the girls arriving in Portland and all of us being together again, I am looking forward to us having brunch at a good friend’s home next Sunday morning and I know that it will be delightful. Our sons were friends in high school, and Joan was a big help to us during Meiling’s and WenYu’s adoptions, and I can’t wait for her to see how beautifully the girls have grown up. I’m also looking forward to getting together with another good friend for coffee later this morning at one of our old haunts. Thinking of good things that happened: Being able to get a temporary crown on my broken tooth, and finding out that I won’t need multiple procedures to fix it was the best news this week. 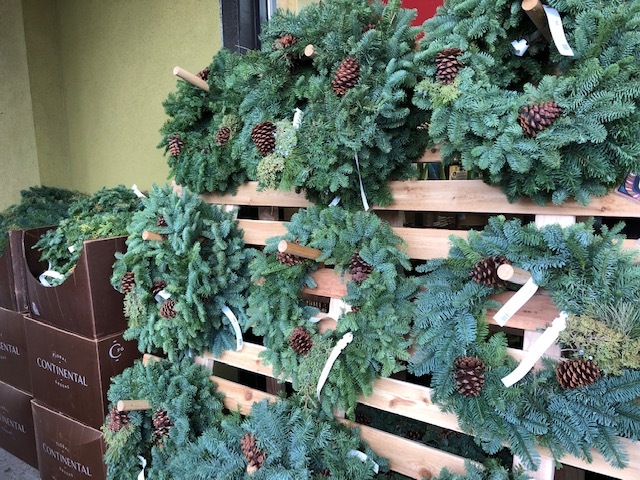 The pine swag smells wonderful! Thinking of frugal things we did: 1) I got a very good deal on a new phone from T-Mobile. The price was lower than I expected and with the trade-in of my old phone I ended up paying several hundreds of dollars less than I thought I would. 2) Although we’ve done a lot of shopping here in Portland we haven’t gone crazy, which is something I worried about before we arrived. We’ve stuck strictly to necessities for the most part or pre-planned purchases, like my phone. 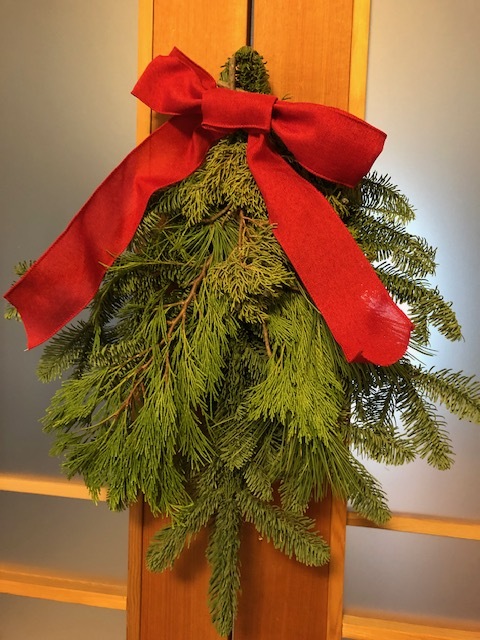 3) We saw a little live tabletop Christmas tree the other day that smelled wonderful and would have been adorable on the coffee table, but it was $25 so we passed. The cheap ornaments we bought at Target along with a string of lights for around the door cost us just $5, the poinsettia was $6, and our pine swag was $8, so we saved $6 over the tree and the house looks (and smells) ready for Christmas! Meiling is going to take the lights and ornaments with her when we move on. 4) Brett and I have done a good job of eating leftovers so that no food has been wasted. 5) He and I also decided not to give each other any gifts this year because neither of us needs or wants anything right now. Instead, we’ll save our money and do something special and spontaneous together later when we’re back on the road again. Grateful for: Both Brett and I are exceedingly thankful that our dentist here was able to fit us in so quickly and repair our broken teeth. We are also very, very thankful for our good dental insurance – we will have a co-pay, but most of the cost will be picked up by our insurance. We are also thankful for the great haircuts we got from the stylist recommended by our friend. Finally, we’re feeling very grateful that we were able to find an affordable and nice Airbnb for our month in Portland. So many of the places in town were way, way over what we could afford. Requests from the girls that will be long gone before Christmas! Bonus question: What Christmas traditions are you maintaining this year? On Christmas morning we will enjoy our traditional breakfast of toasted bagels, cream cheese, smoked salmon, fresh fruit (berries? ), and orange juice. The girls took their Christmas stockings and little sequined boxes with them to college this year and are bringing them along when they come “home.” They will be able to open the gifts in their stockings before breakfast, and we always tuck a little something into the little boxes (that I found for around $1 each, I think, at WinCo one year). After breakfast we’ll open our presents, one at a time from oldest to youngest. We’ll enjoy a relaxing day together, and I’m preparing a favorite meal of ham, macaroni and cheese, broccoli and cornbread, and we’ll have cheesecake for dessert. That catches us up here at the Nomad’s Portland home for this week.Although we love the holiday season, I know it’s not always a happy time for everyone, but I hope the days are going well for you nonetheless, and that you’re able to enjoy time with family and friends. Thank you for sticking with us Nomads as we travel around – there’ll be more coming up after the first of next year! 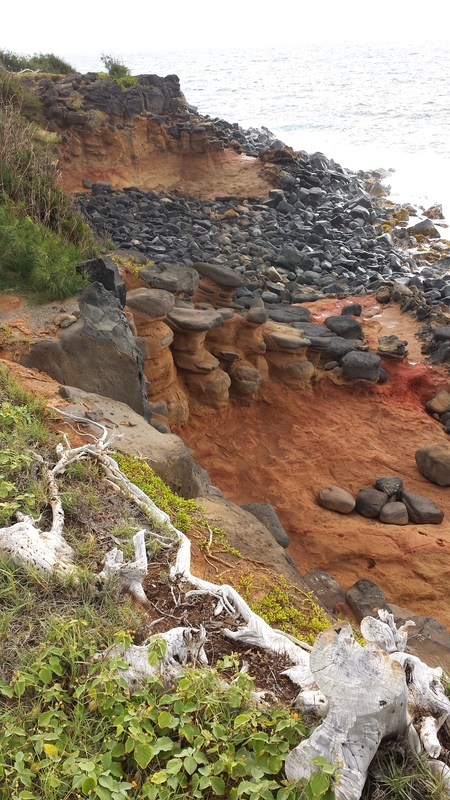 This is just a jumble of images from our life on Kauai, a glimpse or two of random beauty. Waterfalls are among our favorite sites to see, and this little gem meets the sea just north of Donkey Beach at ’Āhihi Point. It’s only an intermittent trickle (tickle in Newfoundland), which sometimes runs dry in summer, but the sight and sound is especially soothing on warmer days. Looking west across Kuhio Highway (56) from the top of the tree-tunnel pathway down to Donkey Beach provides a spectacular view of Kauai’s major water supply: cloud-capped mountains. 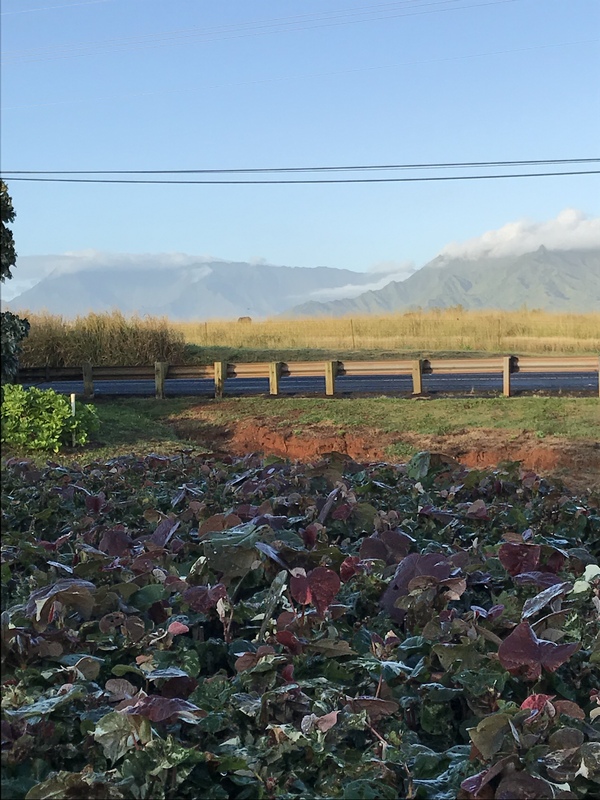 Wai’ale’ale Ridge, in the background, features the two tallest peaks on Kauai: Kawaikini at 5,243 feet (1,598m); Wai’ale’ale at 5,148 feet (1,569m). Makaleha Ridge, in the foreground, is surrounded by peaks averaging half that elevation and the highest point visible in this photo is Pōhaku Pili at only 2,477 feet (755m). Closer to home, the skies offer spectacular shows like banshees, and dragons, and zephyrs, oh my! Some of the most unbelievable sights really can be found right in your backyard. 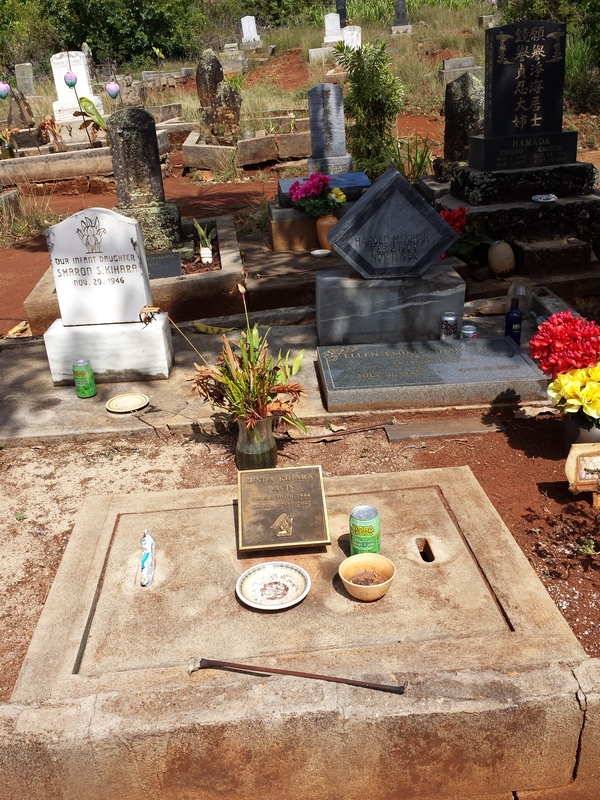 After living here for nearly four years, I finally pulled off Kuamo‘o Road to visit the Royal Birthstone, Pōhaku Ho‘ohanau, where all of Kauai’s Ali‘i (Chiefs) were once born. Then again, I had always wondered where those stairs at the back went, and presumed that they led to a viewing platform. 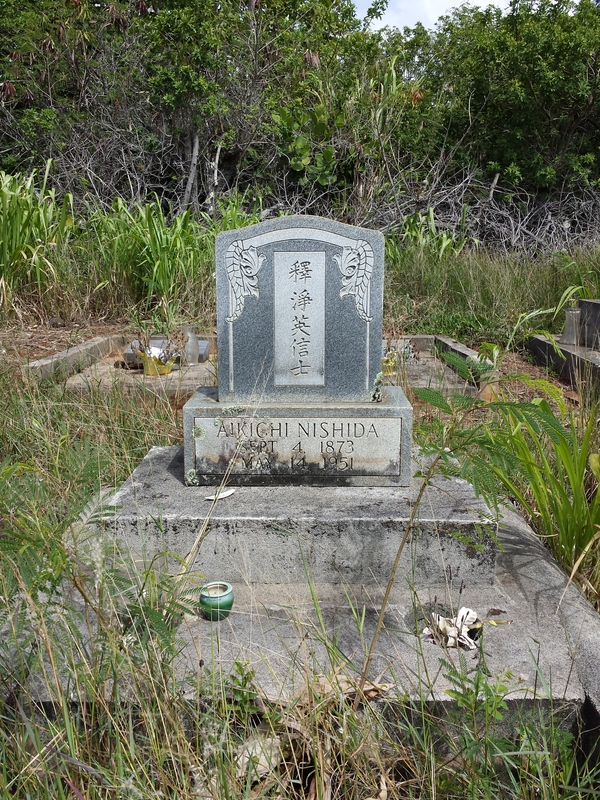 But oh no, they lead to a Japanese cemetery, which is visited often by descendants and loved ones. 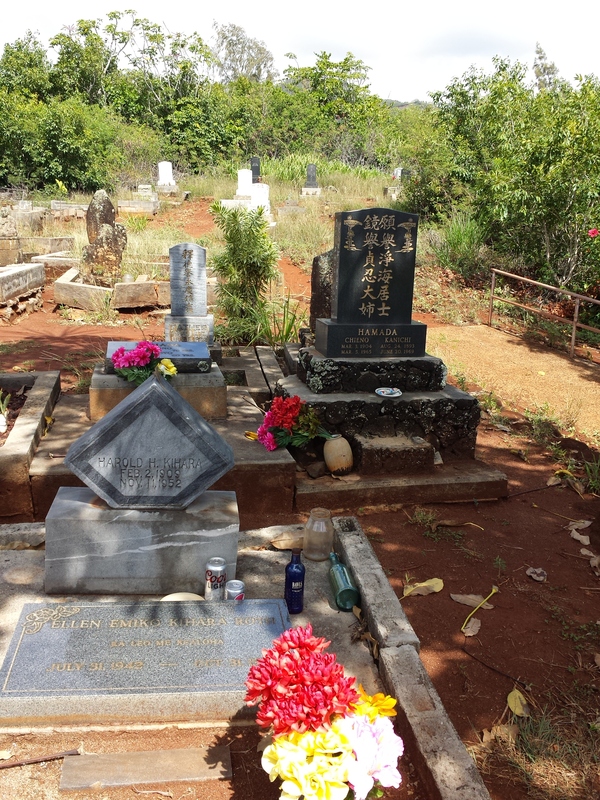 That is, there were fresh flower arrangements, toys, and food for hungry ghosts throughout. 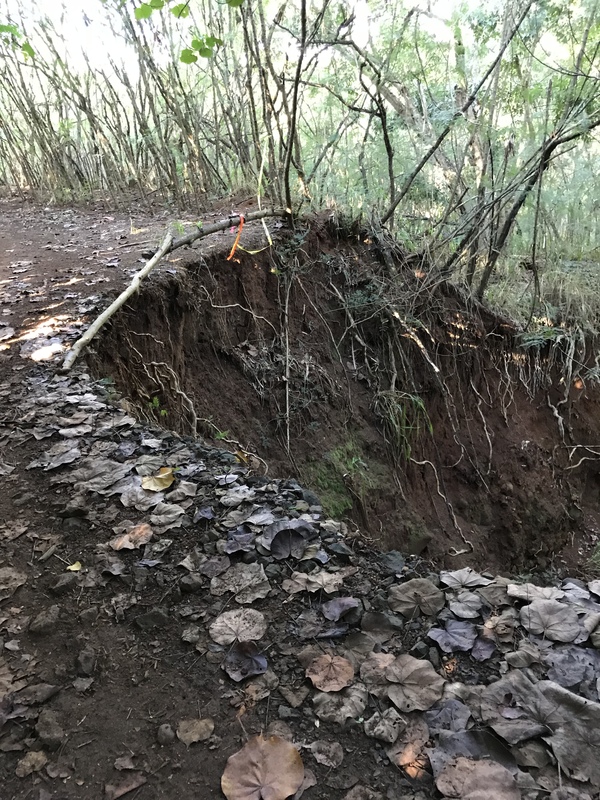 On Monday, during my morning hike, I took a picture of a treacherous point along the old right-of-way that may be added to the Eastside Trail for completion to Anahola. Suffice it to say “road narrows”, and it’s been doing so quickly the past couple of years. A stream passes through a narrow culvert under what’s left of the fill and empties into Kuna Bay. Speaking of the Eastside Trail, Ke Ala Hele Makalae (The Path that Goes by the Coast), future development to the south may transit this 165-foot (50m) bridge of the former Ahukini Terminal & Railway Company along the way to Ninini Point and Nawiliwili Bay. Naturally, the coast speaks up in winter by way of weather advisories and warnings. It’s violence is fascinating when viewed from shore; not so much viewed from a small boat. Thus ends another week in paradise. 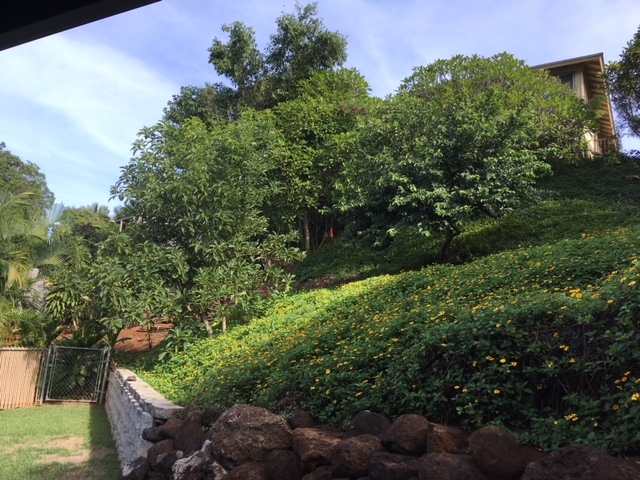 We’ve been enjoying some wonderful fall weather here at Casa Aloha lately, much appreciated after our hot, humid Kaua’i summer. We’ve had a few good soaking rains in the past few weeks which have washed the dust away, and our yard is thriving again. Rather than changing color to red or orange or yellow, the leaves on the plants have been changing back to their normal deeper shades of green, and the grass is thickening up. There are still a few bits of fall color to be found though . . . if you look for them. 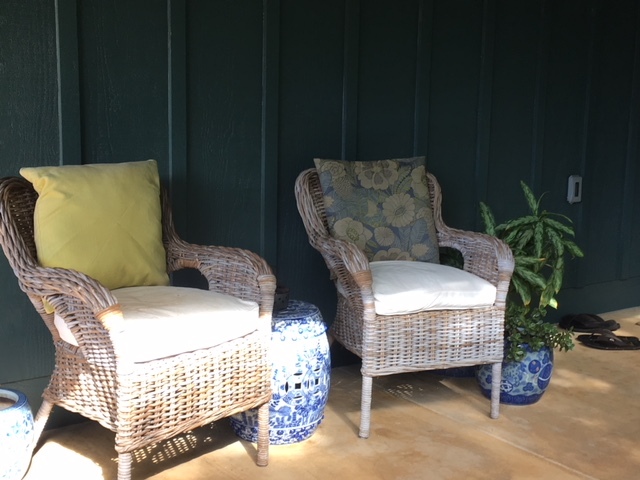 The lanai is cool and inviting, the perfect place for a morning cup of coffee. 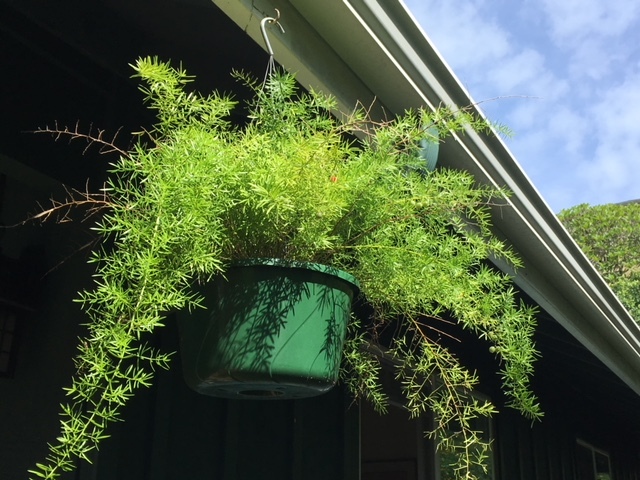 After a hot, dry summer the asparagus fern hanging on the lanai has perked up again, and is sporting a few (somewhat hidden) red berries for fall. 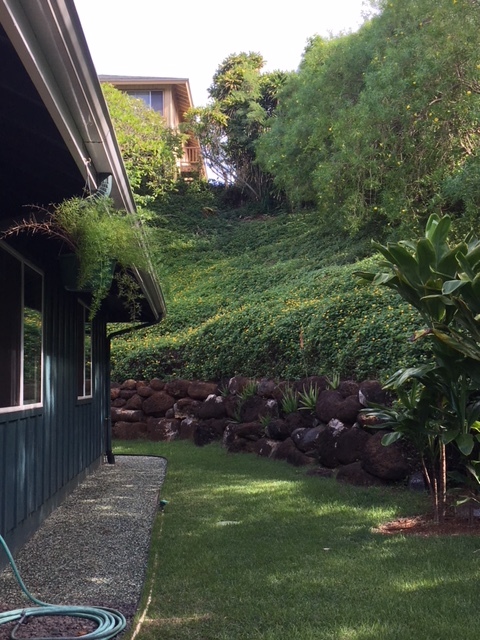 The side yard and hillside are cool and shady in the morning, and filled with lots of green. We thought we were going to lose the wedelia on the hillside from heat and thirst this past summer, but after the rains it’s come back richer and greener than ever, and it’s blooming like crazy. The aloe vera that Brett planted right after we moved in was a washed-out yellowish-green for most of the summer but are now sporting their true green color again. One plant has even produced a lovely fall-colored blossom, which has been attracting little birds (Japanese White Eye) from time to time. 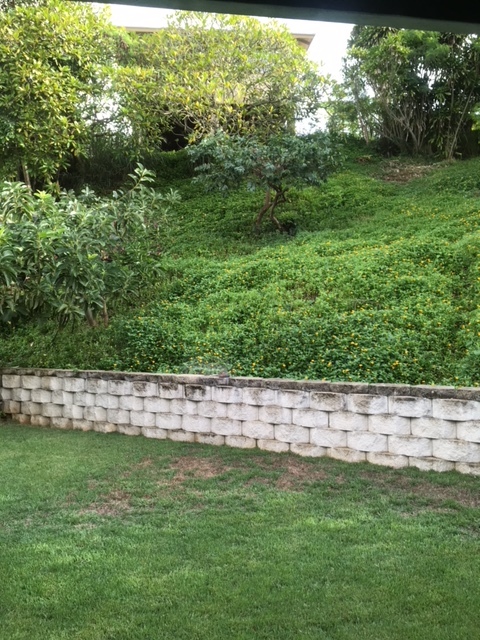 No changing leaves here, but the avocado and guava trees on the back hillside are completely leafed out, and have grown quite a bit. We did get to harvest some lemons from our tree. 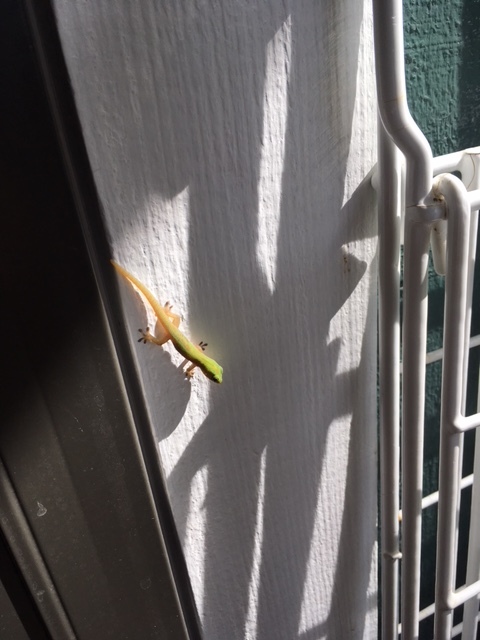 This little fellow, looking ready for fall with his orange feet and tail, was waiting for us by the front door. 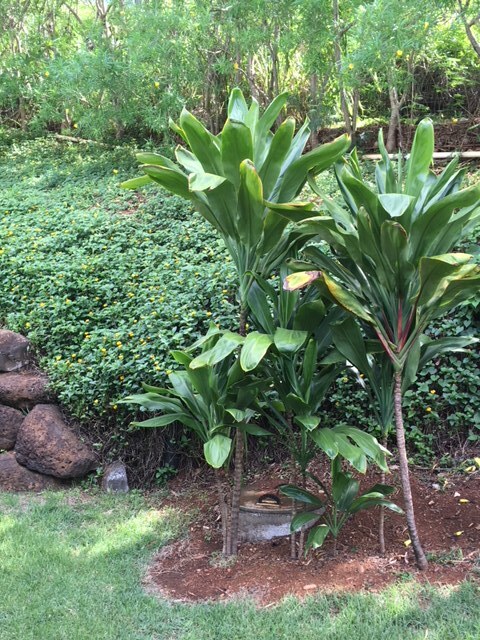 The ti plants across from the lanai seemed listless by the end of the summer, like they’d had enough of the heat and humidity as well, but these days they’re standing tall again. The change of seasons is hardly noticeable here in Hawai’i; they all seem about the same and one segues right into the next. But, after three years here now we can notice and sense the subtle changes when they arrive, and appreciate more what each season has to offer. 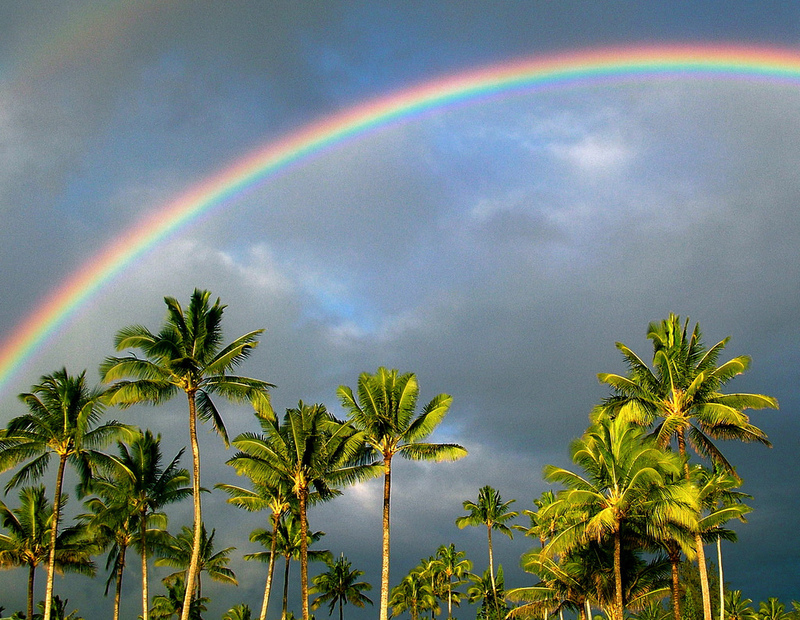 It doesn’t get any better than palm trees and rainbows. This month marks the beginning of our fourth year on Kaua’i. It’s almost a cliché to say it, but it both seems like it was only yesterday that we were scrambling back in Portland to sell our house and make our move, while at the same time feeling like we’ve been here for far longer than three years. Has it been perfect? No, because nothing ever is. Still the good and the sublime far outweigh the bad we’ve experienced since our move. Humidity: As I wrote just a short time ago, I’m not sure I will ever adjust. When it’s bad, I’m miserable. Bugs: Hawai’i is Bug Central. We do pretty well inside our house keeping the critters out, but they are still always with us: mosquitos, centipedes, giant cockroaches, ants, spiders and other small flying things. Dust: Keeping up with the dust here is a daily struggle. 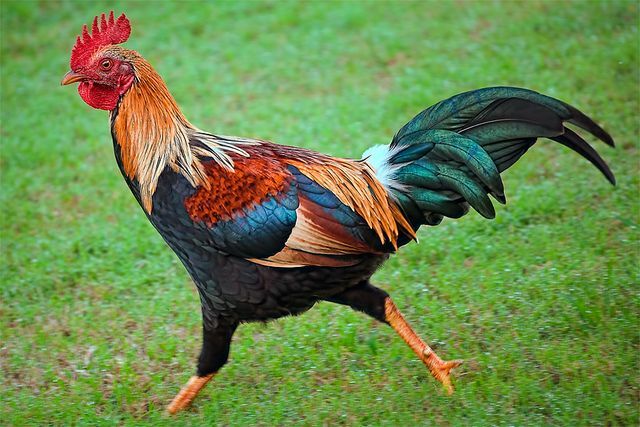 Chickens/roosters: They’ve grown on me in some ways (some of the roosters are positively gorgeous) and they eat lots of bugs, but they have torn up everything we’ve planted in the yard, and can be incredibly loud and annoying at times. I guess I just wish there were fewer of them. Frogs: There are poisonous toads (bufo) here and they give me the willies. Thankfully they only come out at night when I’m safely inside, and they too eat bugs. Still, they’re a giant ick factor for me. It’s expensive: We prepared ourselves for the higher cost of living here, and are managing fine, but food, housing, airline flights, etc. are still more here than elsewhere – prices can still be a shock at times. 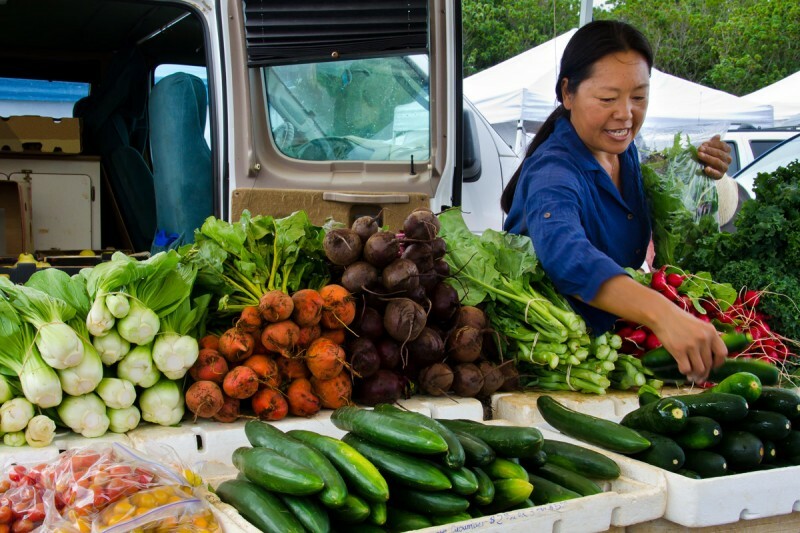 Farmers’ markets: The abundance of fresh, locally grown, affordable produce has meant we are eating more fruits and vegetables than in the past, and paying less for them. Hawaiian-style: We absolutely love the Hawaiian spin on things, especially the way food is prepared using or substituting local ingredients. It’s casual: Every day is casual Friday here. Really, no one cares what you wear, or what your nails look like, or what kind of purse you’re carrying. No one cares about your car either. Our girls’ experiences: None of our girls wanted to move here, and although Meiling returned back to the mainland shortly after we arrived, WenYu now says moving here was the best thing to happen for her, and YaYu concurs. They have thrived here on the island. All three consider Kaua’i home now. 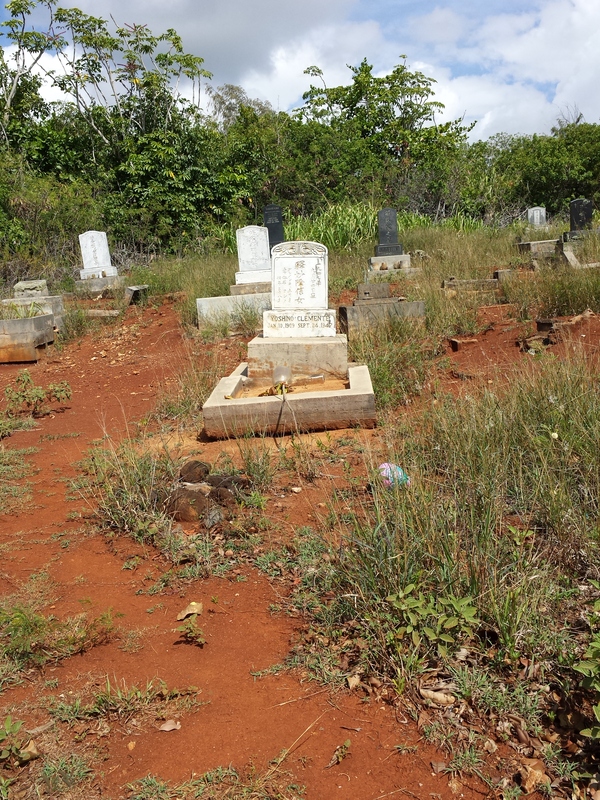 No snakes: It took me almost a year to accept that there are no snakes, poisonous or otherwise, on this tropical island; in the whole state actually. Yeah for no snakes! The expense: While this is one of the not-so-good things about living here, it’s also helped us hone our frugal skills much more than we might have otherwise. 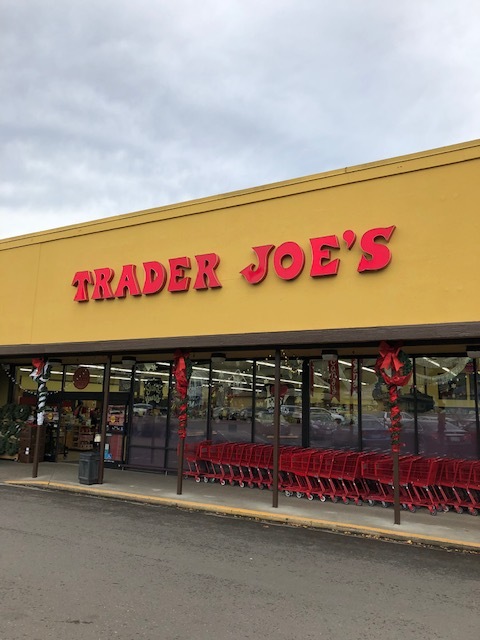 Manageability: Although there aren’t loads of stores or shopping opportunities like in other places, and we’ll never get a Trader Joe’s, we have everything we need here, and it’s easy to get to them. The island is just the right size (for us). The slow pace: The slower way of life here suits us perfectly. Everything gets done, but there’s little to no sense of underlying urgency. Feeling stressed is a rare thing these days. 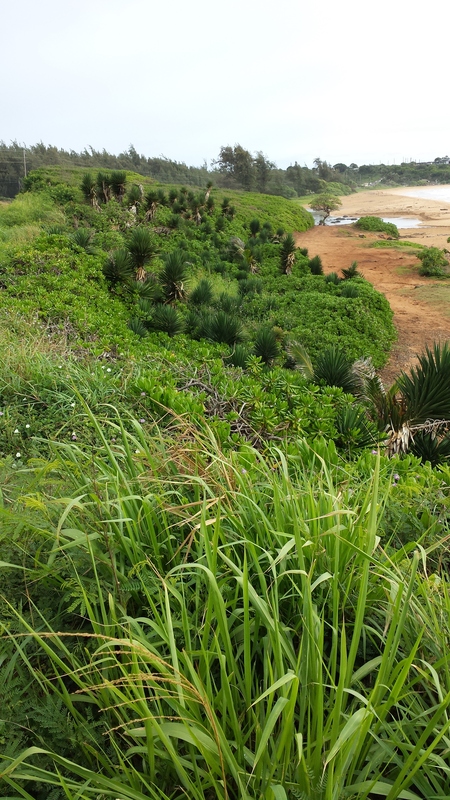 The green: There’s a reason Kaua’i is called ‘The Garden Island’ – it’s beautiful, lush and green all year round. The weather: This was the main reason for our move here, and we have not been disappointed. Yes, it rains and can get very humid, but most of the time it is warm, sunny and the trade winds keep it comfortable. 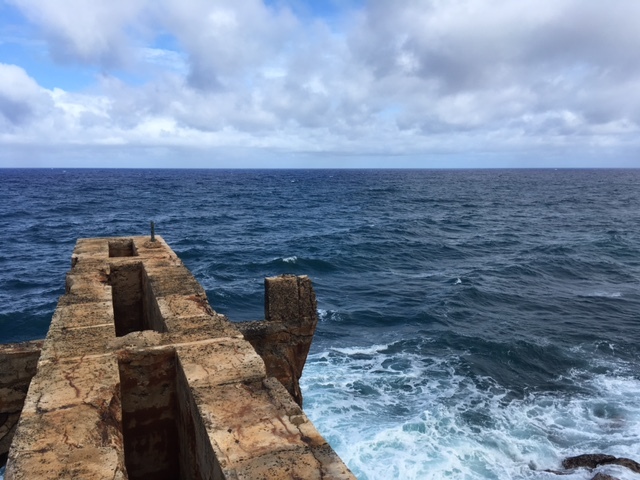 The ocean: I love that I can see the ocean every day, and experience its wonders, from crashing waves to spectacular vistas with colors transitioning from clear turquoise to deep, dark blue. And, there are seals, dolphins, big turtles and leaping whales to observe. There is nothing more invigorating than an hour or so under the umbrella at the beach, even if I don’t make it into the water. The moon and the stars: There aren’t words to describe how beautiful the night sky is here. Because there’s no ambient light to dull the view, stars literally blanket the sky. The full moon here shines like a spotlight. Sunrise, sunset: One word: breathtaking. Almost every day. Diversity: Hawai’i is well-known for its population diversity – it’s a daily fact of life here – but we also experience other types of diversity as well. Even a small island like Kaua’i has multiple micro-climates, so a trip to the north shore or the west side of the island means different foliage and temperatures than we have here on the east side. The local culture is also different depending on which part of the island you’re on. The aloha spirit: There is a genuine friendliness here that I’ve never experienced elsewhere in the U.S. Aloha means sharing, living in the present, caring for others and the land, and enjoying life and feeling joy, and we experience these things every day in our interactions with others (even though most locals still think we’re tourists). Here’s to three wonderful years – lucky we live Hawai’i! Daily walks are a fact of life following our recent trip to Japan—I never want to be so out of shape in another country again. 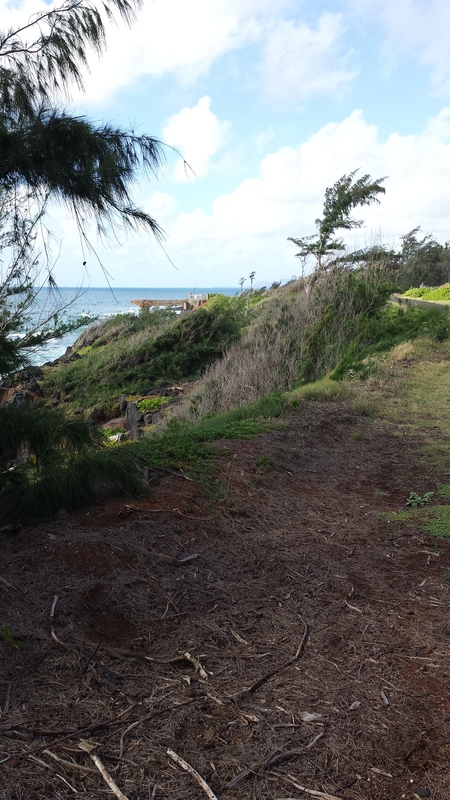 To keep it fairly mudless, I decided to walk sections of Ke Ala Hele Makalae (The Path that Goes by the Coast) from Kapa‘a to Kealia to Paliku Beach, also known as Donkeys Beach. 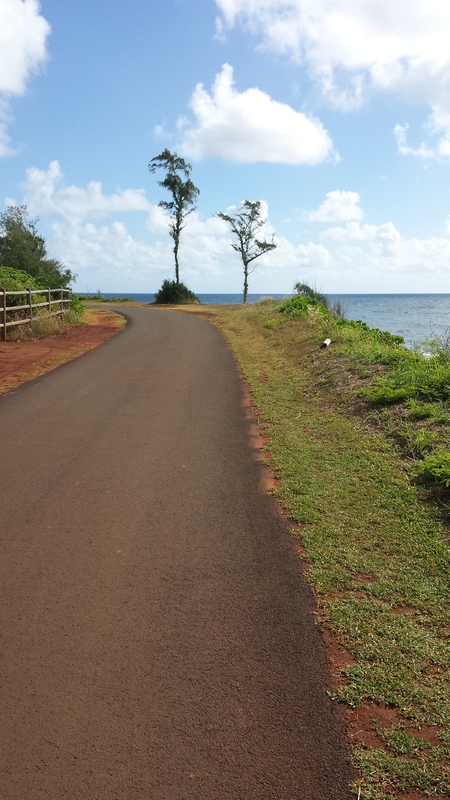 The one-way distance from Kapa‘a Community Center to the north end of the path is about 3.4 miles, and Kealia Beach is a nice midway turnaround. So, over the past month I’ve walked at least one hour each day at 3–3.5 mph (5–5.5 kmh) while observing tide changes as well as familiar and unfamiliar scenery along the way. When conditions are just perfect following a good rain one can see Wai‘ale‘ale and Makaleha Falls from the north end of town; on days like this, you just know that they’re out there. 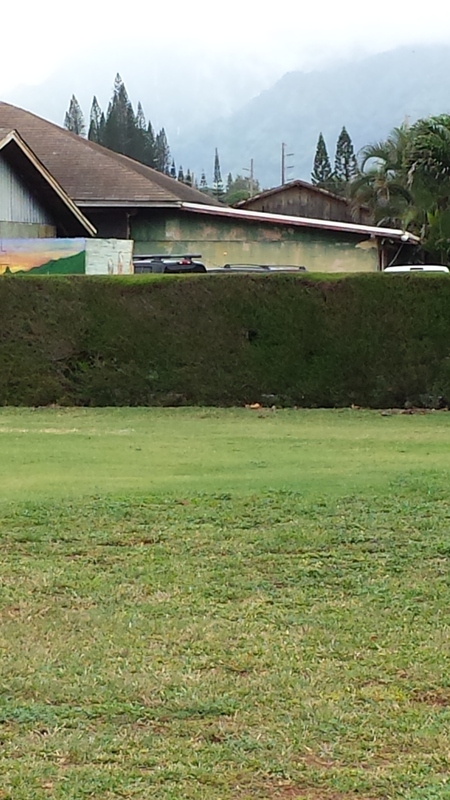 Just over that hedge is the north end of the Kauai Products Fair, a kitschy little tourist trap. The path overlays the roadbed of the former Ahukini Terminal & Railway company right of way, and thus features many of the elements one might expect to see on a train ride. 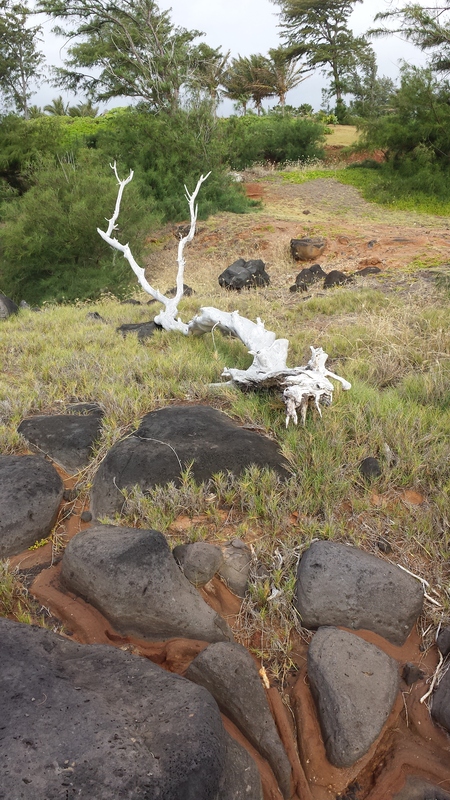 Below is a shot taken within the cut at the summit between Kapa’a town and Kealia. I took this shot not only to reveal the striations in the soil but the various wildflowers growing along the top and left face of the cut. The fence in the foreground is to catch falling rocks—a recurrent hazard along the path. Just beyond the crest, the landscape and flora change rapidly. 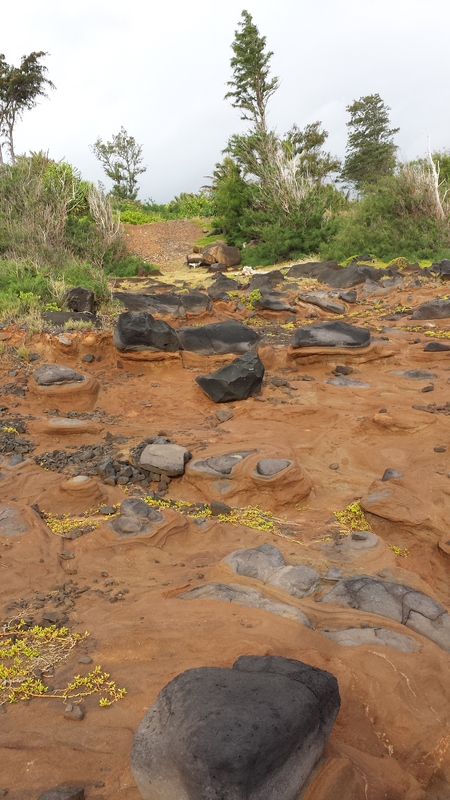 Here, overlooking the mouth of Kapa‘a Stream are plants that look like they were plucked from the Sonoran Desert. 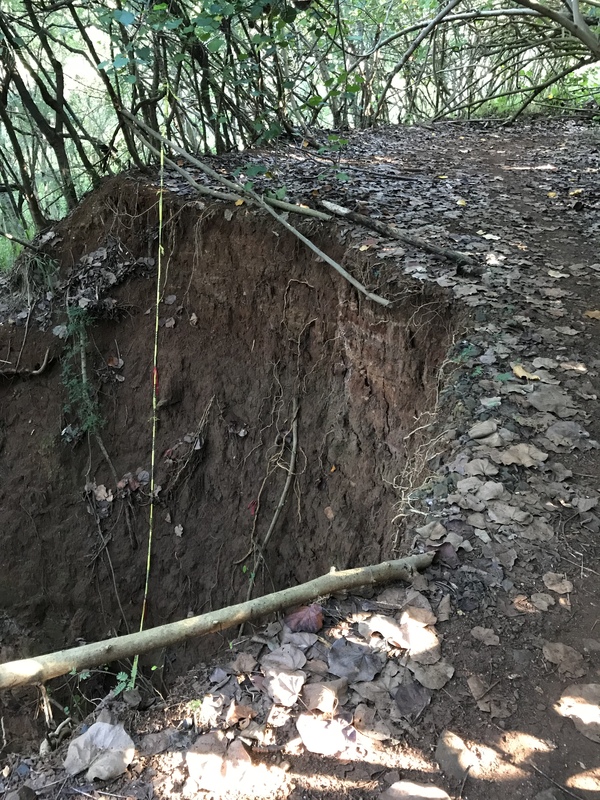 They are growing out of inhospitable rocks, but as the soil improves downslope, they give way to the usual and customary specimens. One morning I was fortunate enough to glimpse Makaleha Falls, looking west at the intersection of Mailihuna Rd and Kuhio Highway (56) near the mouth of Kapa‘a Stream. That photo bomber at left center was a Nene, the indigenous goose, I believe. Typically, at low tide the scene from the north end of the bridge, looking south, resembles the one at left. For the first time since we moved here I caught the windless shot at right. 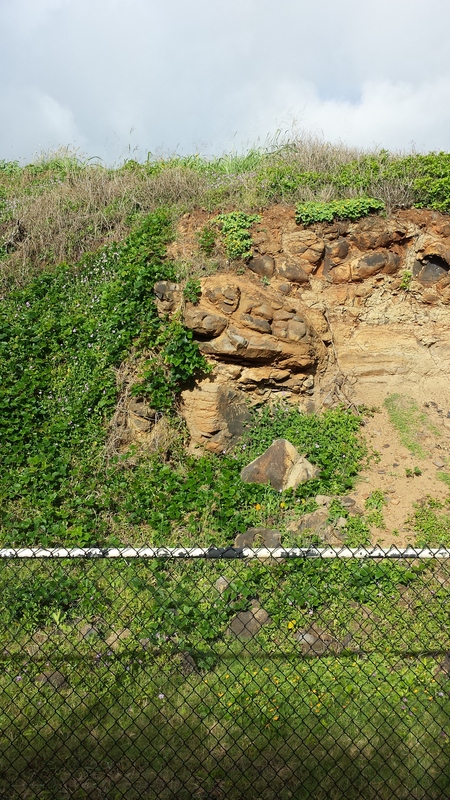 The old railroad cut is evident in the background and clearly illustrates the effect of the prevailing wind on plants along the coast. 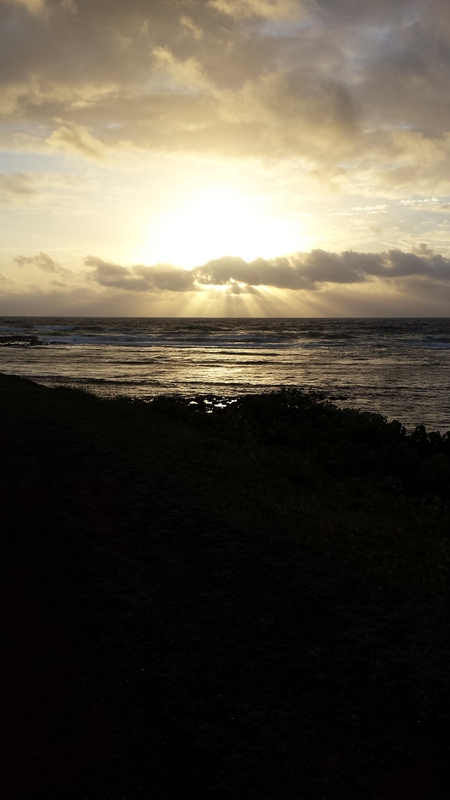 I often park at Kealia Beach because it expands my options for going north or south, or a little of both if it suits me, and that variety helps keep the walks interesting. 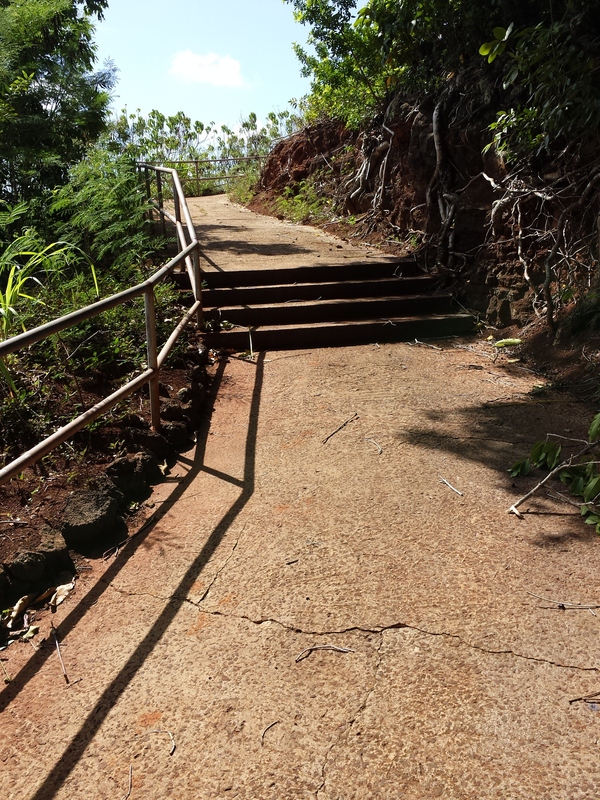 Other days, I walk up from the house, and down Mailihuna Rd and cross Kuhio Highway at the north end of Kealia Beach, then head back to town, and home via Kawaihau Rd. 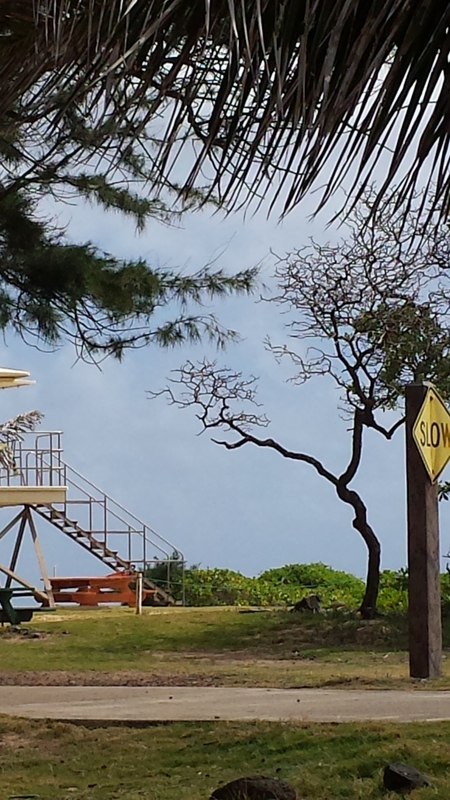 Below, the Kealia Lifeguard Station, as seen through the windshield from the parking lot. Proceeding north out of Kealia, both wind and ocean, deafening at times, are constant companions.This shot was taken about halfway between Kealia and the Pineapple Dump. Next stop: the Pineapple Dump. 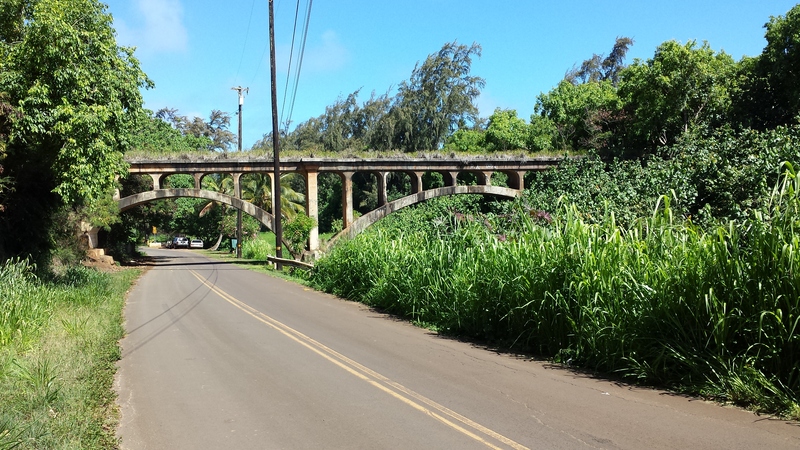 Once upon a time, the sugar trains were idled only on Sundays, and an engine and side dump cars were made available to the cannery at Kapa‘a. Pineapple tops were hauled out onto the little pier, tipped and emptied into the ocean to be carried far away. Sometimes the tides and wind were not so favorable and the tailings were slammed back into town along the beach, and the smell was… awful, so I’m told. 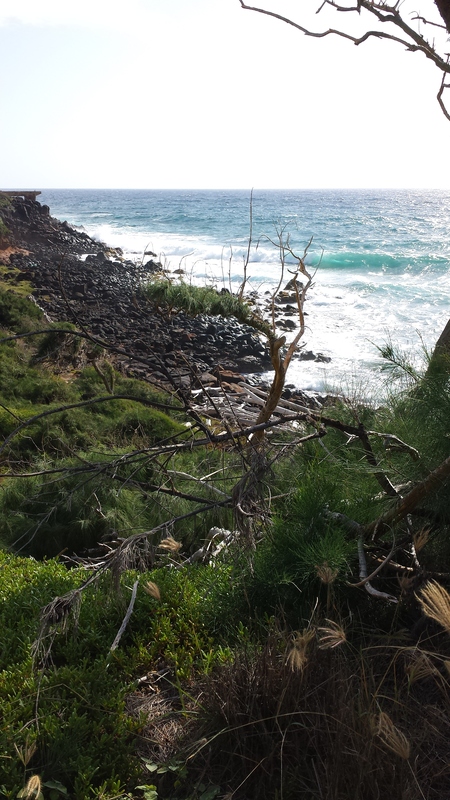 Looking back on the Pineapple Dump, and on the way to Donkeys Beach. Again, the direction of the prevailing winds is easily distinguished by the habit of the trees and shrubs hugging the coast. Stopping to study another planet, or so it seems from the random distribution of stones on all but lifeless red dirt. Further along, I encountered what looks like a nursery for table rocks. Yes, if you have a state or national park and are seeking table rocks for your collection, this may be where they’re born and raised. “Reindeer Slug,” the first thing that came to mind when I looked up and saw this old snag lying on the ground. We do have some pretty big slugs and snails here. Even weeds are special here. I cannot identify them all, but enjoy them nonetheless. Three or four varieties of morning glories thrive on and off the path, some low ground cover that looks rather more glacial than tropical, and here and there so hardy bright yellow flowers. There you have it then, 3.4 miles in what, 20 minutes? You’re fast! There are many more plants, people, and other animals to see along the path, but my objective was to cover a considerable distance as quickly as possible, exercise that is, so whether you live here, or you’re just visiting, take a hike; have a look. Heading to the sunset out over Hawai’i. The clouds in the distance are from two hurricanes approaching the islands. I arrived home after a very, very long and tiring travel day yesterday and am so happy to be back. My suitcase has been unpacked, the washing machine is doing its thing, and Brett and I will be heading off to the farmer’s market in a short while (we’ll do our big Costco shop tomorrow). It’s hot and humid here, but after all the dry air I encountered while I was gone, it feels wonderful. The entire trip was a total success, but it was totally exhausting as well. I suffered from jet lag the entire time I was gone – I could never quiet adjust to where I was. Four of the eight days of the trip were spent flying to one destination or another or waiting in airports. The shortest flight of the trip was the two and a half hours spent flying from Denver to Seattle. One flight was over four hours (Boston to Denver), and the rest were all over five hours long. I woke up at 5:30 a.m. on Tuesday back in Colorado (2:30 a.m. HST) prepared for a slow drive down to the Denver airport because of traffic, and also to give myself time to gas up the rental car, get some coffee, and turn in the car at the rental agency before heading to the airport. Although I had been warned about the possibility of heavy traffic heading down to Denver, there wasn’t any to speak of that morning and I flew down the highway at 80 mph, with other cars passing me the whole way! None of the tasks took any time at all, and I was pre-checked through TSA so I ended up at my gate at 7:30 (If I had had to go through the regular screening it would have taken a very long time because the lines were so long). My flight didn’t leave until 10:30, so I spent my time walking through the airport and reading. Our plane arrived in Seattle on time, which meant I had an exhausting five-hour wait until my flight to Kaua’i. 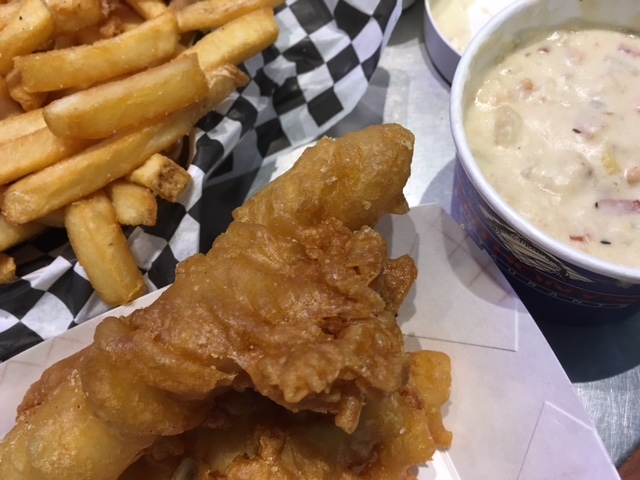 The first thing I did was to head to Anthony’s Fish Bar for some fish & chips and clam chowder, which had been recommended. That was a good move – I was very hungry, and the food was reasonably priced, hot and delicious. After I finished I again walked through the airport a few times and did some more reading, and then finally boarded on time for the 5+ hour trip home. 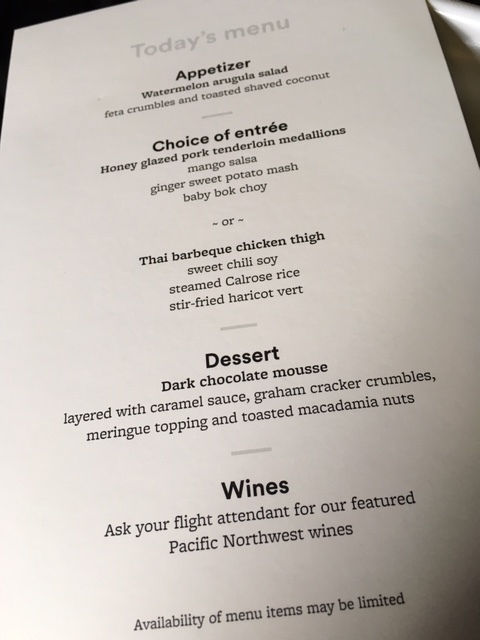 First Class dinner menu – it was very, very good (I had the pork but only ate the potatoes and bok choy). One of the smartest things I did though was treat myself to an upgrade to First Class for the last leg of my trip. For $150 I had a big, comfortable seat for my weary body, free entertainment, and good food and other treats to enjoy on the way home. The upgrade cost less than half of the extra I would have paid for First Class if I had booked the ticket upfront. I’ve already informed Brett that from now on we are including enough in our travel budget to allow for last-minute upgrades if possible on the way home. 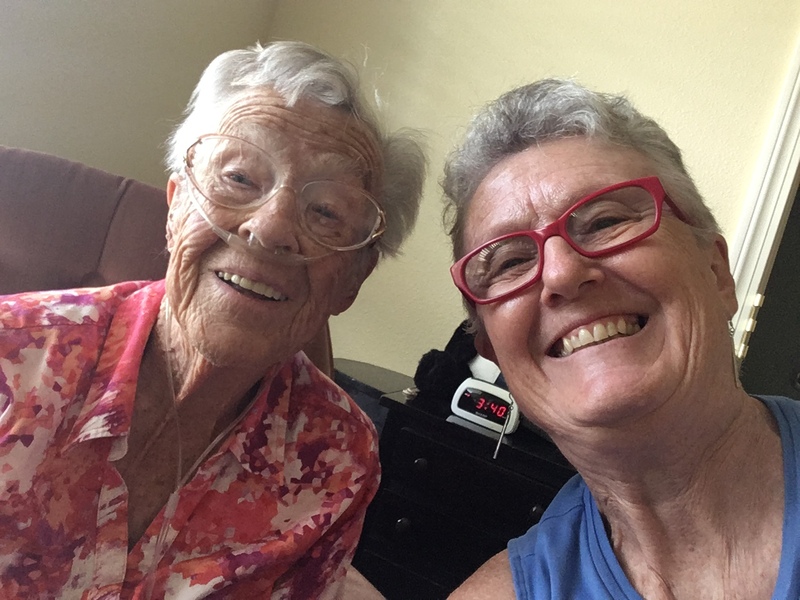 Two old ladies: A selfie I took with Mom. She was fascinated by the selfie process. She also was fascinated with my Kindle, and wanted to know how the whole thing worked. I had a very good visit with my Mom in Colorado. She knew who I was the minute she saw me, but I doubt today she remembers I was there – her short-term memory is very weak. We spent our time sharing memories from the past, and photos on my computer of Brett, the girls and Hawai’i (she knows that’s where I live). On the second day there she asked to go to Trader Joe’s with me, and she enjoyed walking through the store with me and looking at everything while I bought some things to bring home. I got her some figs, peaches and avocados, because she had said she missed them. All things considered, her condition was better than I imagined, and it appears her cancer is progressing slowly, at least for now. It was sad for both of us to say good-bye to each other though. The house seems empty without WenYu, but the room she shared with YaYu is now clean and organized, so I guess that’s a plus. I know it will take some time to adjust to her being gone when evenings arrive, but she is doing well back at Wellesley and settling in. I caught a glimpse of her in a photo taken at the annual convocation held today, which did my heart some good. We won’t be doing any more traveling again until next March, when we are scheduled to go to Japan. In the meantime we’ll be beefing up our savings, and enjoying our retirement and more time with YaYu. Way back in 2011, Brett and I both independently came to a realization that we didn’t want to stay in Portland after he retired. We had lived in Portland for nearly 20 years at that point, and while we had put down deep roots and there was much we loved about the city and the Pacific Northwest, he and I had both grown very tired of the dreary winters and wanted to live someplace where we could enjoy the sun a bit more consistently. While we loved all the green that came with Portland, we were both weary of hibernating all winter, of having to go to work and school in the rain, and of everything else that came along with all the cold and damp. We initially didn’t weight any of these as more important than the others, except for the weather, and other than the weather we didn’t consider any one item to be a deal killer on its own. I’m an ocean person but Brett loves the mountains and wanted opportunities for hiking. Although we really hadn’t had anything to do with the military since Brett’s retirement from the navy in 1992 other than renewing our ID cards, receiving retirement pay, and using the health insurance, we figured having military facilities nearby was something we might need or want to use as we grew older. Good schools and a sizable Asian population were important for the girls. Florida was the first to be removed from our list. We had lived in Florida while Brett was in the navy (Key West), and although it’s plenty sunny we had absolutely no desire to ever spend another summer there. Alligators and snakes were also a black mark. While there are some good schools in Florida, they are mainly in expensive neighborhoods that were out of our price range. Florida’s Asian population is negligible (1.7% of the entire state), and there were other things about Florida we just didn’t care for. Plus, it was a l-o-n-g way away from Japan. The Southwest was eliminated next. It had many things going for it, except for the ocean thing, and the Asian thing again (3.4% of the population in AZ, 1.7% in NM). Plus, it’s very dry there, too dry for me actually, and it’s HOT. The Southwest wasn’t as far from Japan as Florida, but still not very close. So that left southern California and Hawai’i on our list. Can you tell what very important item was left off of that list of priorities? If you guessed taxes, you’ve guessed right! 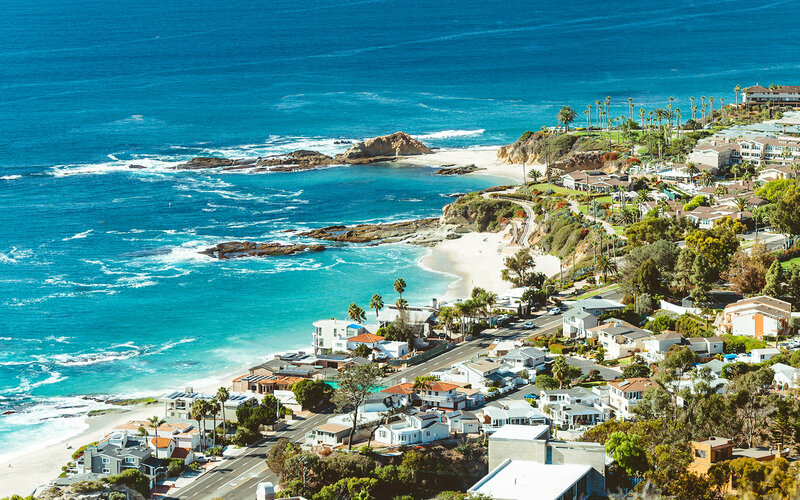 I grew up in southern California and there are many places there I could have happily retired to except . . . our retired income would have been eaten alive by state taxes. California already had a high cost of living strike against it, but the taxes, both income and sales, made it unaffordable. And that left Hawai’i, our “joke” location. But guess what? 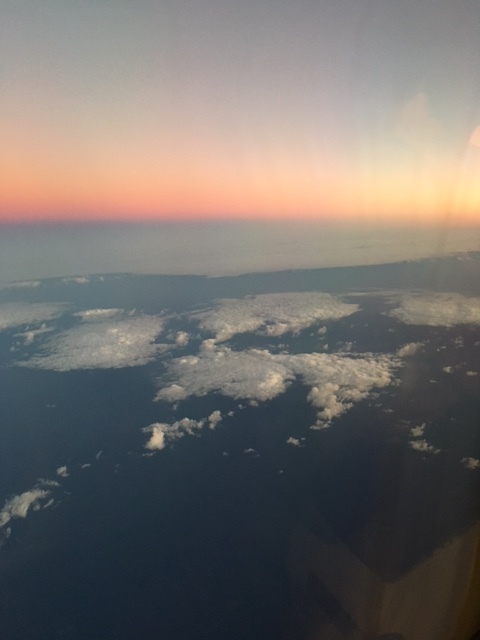 Hawai’i had beautiful weather, an ocean view every day and loads of beaches, mountains for hiking, easy access to Japan, a large Asian population, and close proximity to military facilities. It was also very tax friendly for retirees, especially those receiving government, state or non-contributory pensions (which would be us). Seven out of nine items on our list of priorities gave it a very high score. Hawai’i! Who could have guessed? Cost of living and schools remained BIG issues though, as did the state’s isolated location, but we figured if Hawai’i had everything else we wanted, then we could figure out how to work around those issues. We began researching the state, decided which island we wanted to live on, and eventually which school we wanted our daughters to attend (we actually wanted them to attend a private school, but after a tour they nixed that in favor of the public school, which turned out to be the right decision). We asked lots of questions, read forums, and tried to learn as much as we could from long-time residents and successful transplants about dealing with cost-of-living and other issues unique to living in Hawai’i, and made sure to add travel expenses as part of our budget. 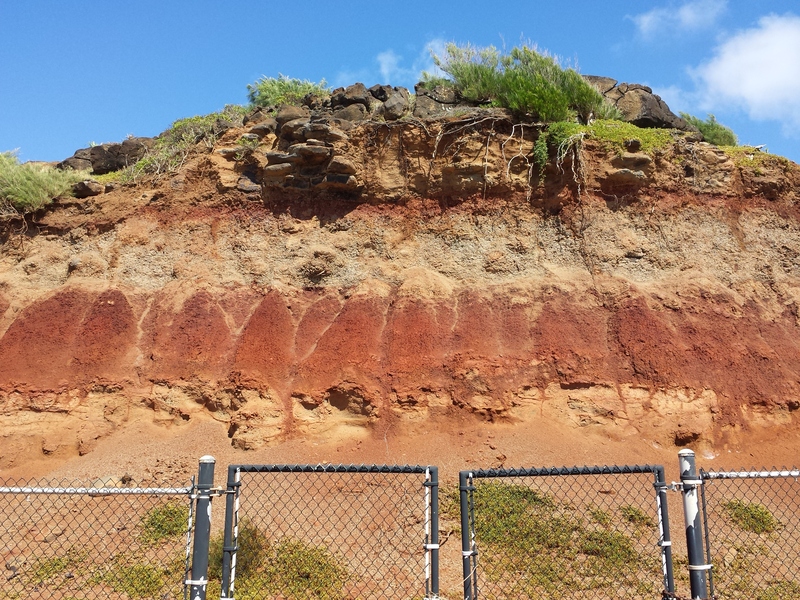 After a nearly three-week vacation/research trip in 2012, Hawai’i was no longer a joke. We committed ourselves, and less than two years later, after much downsizing and planning, we made our move. 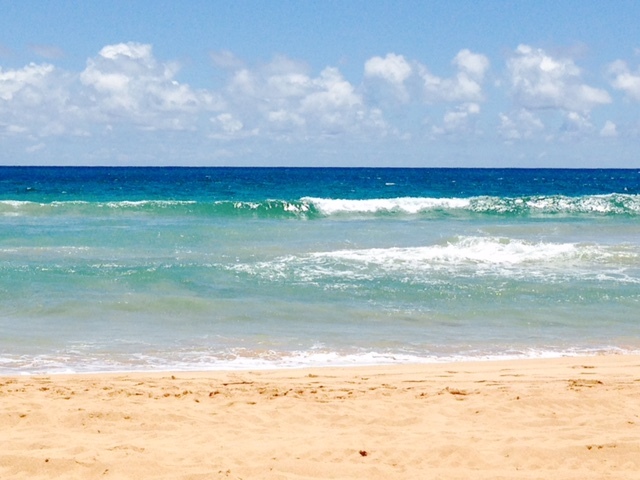 We came to Kaua’i with no expectations other than we’d enjoy beautiful weather and see the ocean every day. Everything else we decided to let unfold in its own time to let us know if we’d made the right decision (or not) for our family. Did we? I’d say yes, over and over and over. 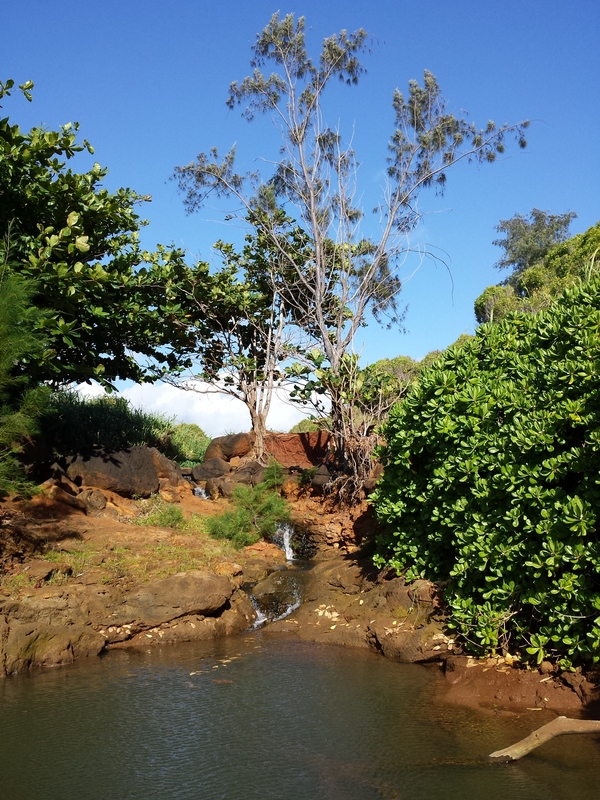 Kaua’i has provided everything we hoped it would, and more. 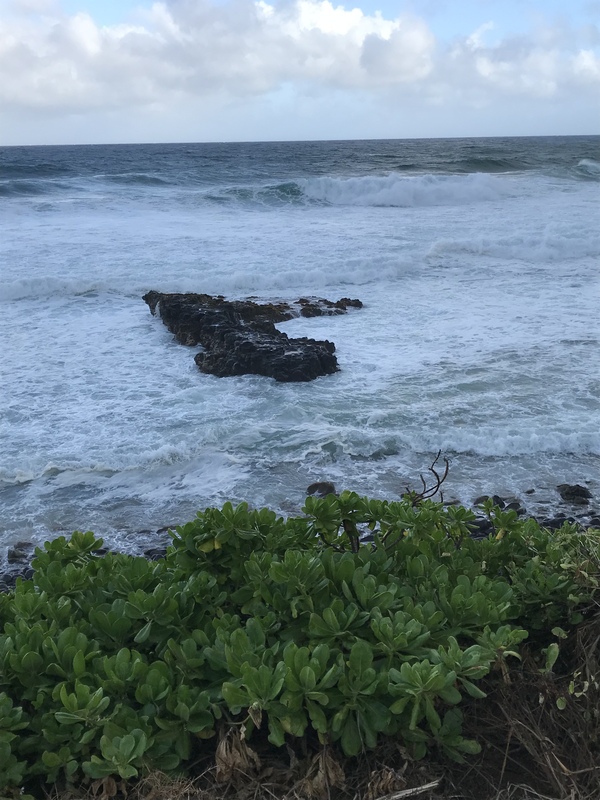 Our oldest daughter returned to Oregon after six months on Kaua’i, and that has been the right move for her – she manages living on her own and going to school very well. But, WenYu and YaYu have thrived here, and are now very happy we came; they love our little island and the friends they’ve made here. We’ve pretty much figured out the whole cost-of-living thing, and our simple life these days actually lets us live on much less than we did back in Portland. 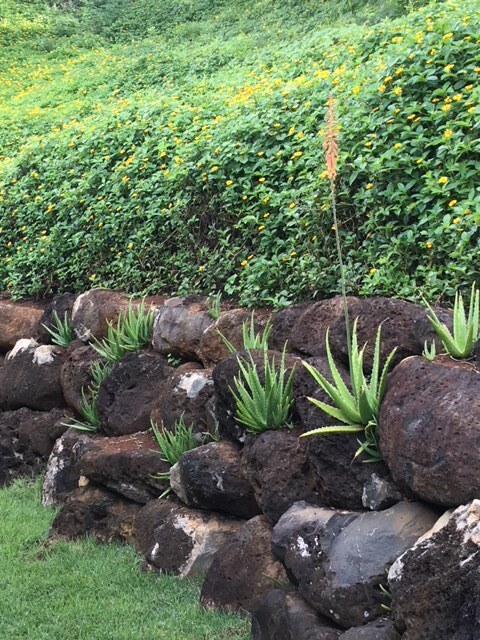 Kaua’i is very lush and green, with flowers blooming and farmers’ markets open year round which make me very, very happy. I’ve been to Japan twice since we’ve been here, we’re going again next year, and our son and family have come to visit us here. 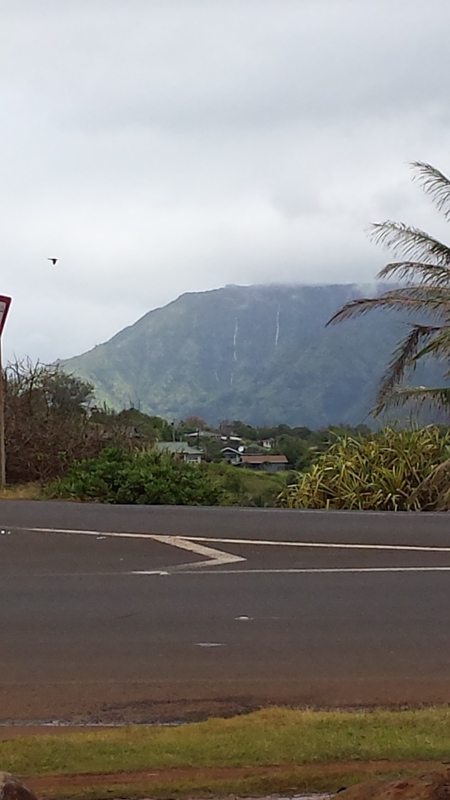 We’ve all made trips back to the mainland, but discovered that there’s nothing as wonderful as coming home to Kaua’i.